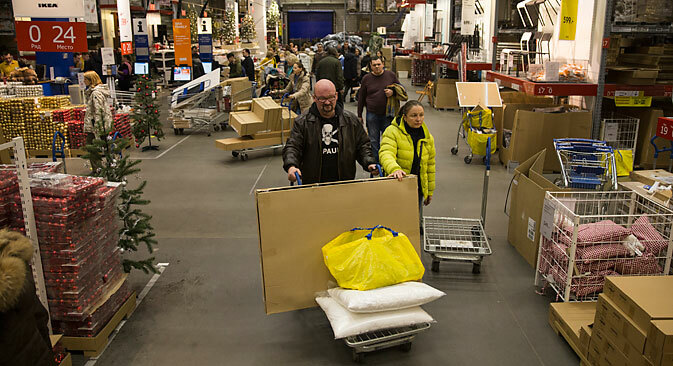 Swedish furniture giant IKEA is to invest about 200 million euros in the expansion of its retail centers in Moscow. Earlier, despite the recession in Russia, one of the leaders of world retail, French hypermarket chain Carrefour, announced its entry into the Russian market. According to experts, the retail sector in Russia is still attractive for its growth potential even though the population's purchasing power is falling. The Swedish home furnishing giant IKEA has decided to invest about 200 million euros in the expansion of its retail centers in Moscow, according to an announcement made by General Director of IKEA Centers Russia Armin Mikaeli, reports the Kommersant business daily. According to Mikaeli, the expansions will see the two IKEA hypermarkets increase in size by 30 percent by 2018. Earlier, in the middle of May 2015, despite the recession in Russia's economy, one of the leaders of world retail, the French hypermarket chain Carrefour, announced its return to the Russian market. "Despite the constantly increasing level of competition in the sector in the last years, the penetration of modern commercial formats in Russia is about 25 percent less than the average indicator in developing countries," says Timur Nigmatullin, an analyst from Finam Investment Holding. Second time lucky for Carrefour? Unlike IKEA, Carrefour plans on entering the Russian market indirectly, through the Emirati holding company Majid Al Futtaim Group, which owns a franchising chain. The presidential press office in Tatarstan – a mostly Muslim-populated Russian region 500 miles (800 kilometers) east of Moscow – told RBTH that the French chain intends to open its first store in Tatarstan. This is not the chain’s first attempt at moving into the Russian market. In 2009 Carrefour opened two stores – in Moscow and in the southern city of Krasnodar, the capital of the region where Sochi is located. However, the chain later sold the stores. In 2010, the world's largest retailer, U.S. company Walmart, publically abandoned its plans to enter Russia, without having opened a single store in the country. The company had intended to buy a large Russian retail chain, but negotiations were unsuccessful. “The retail sector in Russia is still attractive for foreigners because of its growth potential,” says Dmitry Bedenkov, director of the analysis department at Russ-Invest. "Large chains make over 20 percent from overall retail turnover. At the same time the marginality of the retail business is higher than in other countries." According to Bedenkov, the confidence that investors have in the future of Russia's retail market means that Russian retailers can attract capital on the stock market. Back in February 2015, Russia's largest retailer, grocery chain Magnit, which has 10,000 stores, sold 1 percent of its shares to international investors for 9.8 billion rubles ($162.35 million). Buyer requests were collected in less than one day. In total the chain plans on opening about 2,000 small stores and 90 hypermarkets in 2015. Following Magnit's footsteps, another Russian retailer, supermarket chain Lenta, held an SPO (secondary public offering). Earlier, in the spring of 2014, the company sold 22 percent of its shares for $952 million during its launch on the London Stock Exchange. As in Magnit's case, the demand for capital is due to drastic expansion: The company is expecting a revenue growth of 34-38 percent by the end of 2015. Experts say that the sole factor capable of limiting the development of retail in Russia is the expense of credit resources. "The prospects of developing chains have worsened because of the growth of credit rates on the one hand and on the other because of costs and the fall of consumer demand," says Bedenkov. Another problem is the decline in purchasing power among the population. According to the Ministry of Economic Development, due to the growth of inflation in 2015, real salaries in Russia will fall by 9.6 percent in comparison to 2014 indicators. This will lead to a reduction of the total commercial retail turnover in Russia by the end of 2015 by 8.2 percent, to 28 trillion rubles ($533.6 billion). According to Timur Nigmatullin, retailers should brace themselves: “The situation with consumer demand in Russia may significantly worsen and the payback periods of projects will then substantially increase," he says.